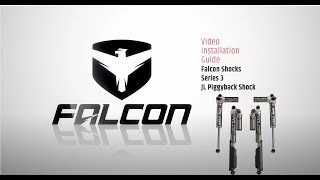 Falcon Series 3.3 Fast Adjust Piggyback Shock Absorbers offer a wide range of adjustability with their easy to use three-position Fast Adjust Knob. Settings include soft, medium, and firm. The middle setting incorporates an eight-position Micro Adjust Dial for more precise tuning between soft and firm. Falcon’s proprietary Volume Optimized Damping (VOD) features a digressive linear valve to improve vehicle feedback, stability, and control during low-speed, high-speed, and off-road driving. As the piston compresses and rebounds, the valve restricts oil flow creating a damping effect. VOD’s quicker ramp up increases damping volume during low-speed driving as well as reduces shock bottoming at full compression during faster speeds or over uneven terrain. Traditional velocity sensitive shock absorbers react quickly during low-speed driving causing excessive “head toss” on rough terrain – or even driveways. Conventional damping then firms up during faster shaft speeds resulting in a jarring ride. With Volume Optimized Damping, stability and control are maintained throughout all driving conditions. • May require 2” Bump Stop Strike Pad Extension Kit (# 1959500) and/or 0.5” Bump Stop Strike Pad Shim Kit(s) (# 1959300).